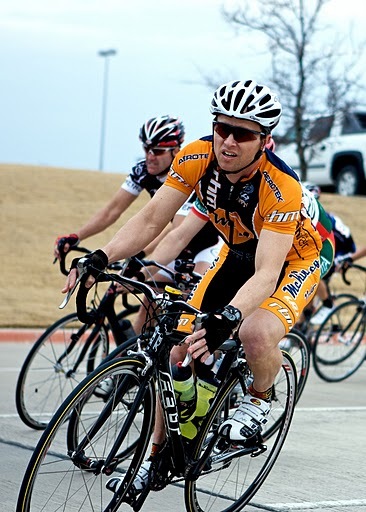 Texas Chainring Massacre starts and ends in Roanoke Texas near the Texas Motor Speedway. It is a winner takes all bike race covering 116 miles of mostly dirt roads. We had a lot of discussion in the MV team as to what we needed to do in order to compete in this event and in the end Chris Powers, Mike Brown and Marco Corsi signed up for it. On Friday the 7th May 2010, the night before TCM, Chris went out in his car to scout the course and after we saw the pictures he took during his reconnaissance trip, we all started to wonder what we had signed up for. The first photo (top left) Chris posted back showed a snake in the course. The next photo (top right) showed a water crossing. Then the last showed a lot of nothing but dirt. The plan was in motion: Chris would ride his new cross bike, Brownie his Battenkill setup and Marco his cross bike. We met at 7am on the 8th and prepared for battle. We each carried 4 water bottles and food plus enough spares for a few years worth of normal riding. The enemy was in the form of Brian Fawley and his 2-wheeled posse from Park Place and Dallas Bike Works. We set out at a fast pace and for the first 20 minutes or so no sign of Brian. He finally caught us and then disaster. Chris flatted. Brownie and Marco stopped to help and Chris got going with a can of sealant. As we were chasing back on, Chris’s tire deflated again. This time Brownie and Marco kept chasing and left Chris. We caught back on just as we all stopped at a Stop sign across Highway 380. Luckily Chris put in a second can of sealant and caught back on at this point too.Very shortly after this Brownie had a catastrophic finch flat which ended his day. At the 60 mile point we intercepted Carol Ann, Marco’s wife who was sent out in her Panzer Wagon to drive Sag. This was really good since without refueling, finishing this thing would not happen. At this point we were 8. Every hill and tailwind section Brian drove a fast pace and before long we were 5. At about mile 75 Brian flats. This is the first bit of good news for us. We lay it down at this point for the next 10 miles with no sign of Fawley. (Remember he did not wait for us when we flatted several times earlier in the race.) Now there are three of us Chris, Marco and a Hooters rider. After a while Chris rides off and comes in for the win with a finishing time of 5h57min. Marco and the Hooters rider come in at 6hours on the nose. A long long day in the saddle and one of the hardest days I have ever done. Brownie ends up riding back to the car down I35W. He has a big tail wind and rides for 20 miles at 40MPH. A few folk finished with road bikes but most of the racers that finished rode cross-bikes with cross tires. JameyWatts (Munroe) (pictured at left) and Mr. Fitness (Steve Borski) travelled down I-45 today to tackle the Coldsprings Cat 3 race. It came down to bunch sprint on the finish hill. With ample support from Mr. Fitness, JameyWatts was in position to contest the sprint. And even though he sat up just before the line (which cost him a placing), he managed a fine 5th place result. (Domestique duties accomplished, Mr. Fitness sat out the sprint and finished well back in the field.) When asked why he chose to race about 20 meters less than everyone else, JameyWatts blamed oxygen deprivation while noting that it's always a challenge for him to contest an uphill sprint with "the lungs of a box turtle." Turtle lungs or not, a 5th place Cat 3 finish is a good day or racing. Congrats to JameyWatts and Mr. Fitness for a solid effort with a very short roster. Well well, well, what do we have here? It's Oz in California (pictured with Bling - just back from the gun show), "buried with work" on the last day of his employer's fiscal half-year. So the next time Oz says he stuck at home with a bunch of conference calls lined up, know that he really means he's heading out for another stealth 100k. Thanks to Seabass for breaking "the Oz code."